Ita (or Eta) Taub (1908 – 2003) was born in the Ukrainian town of Stidenitse on the Dniester river. She immigrated to Montreal and then New York. She published two volumes of autobiography in Yiddish, Ikh gedenk (I Remember), with one volume appearing posthumously. She also wrote a volume of poetry, In klem fun benkshaft (In the Fetters of Longing, Jerusalem, 1993) and published the Yiddish love poetry and love letters sent to her by an admirer (Libe briv un lider by Itzik Freiman). She was well known for her philanthropic generosity and financially supported numerous Yiddish causes, especially those connected to Soviet Yiddish literature. She was a classy lady, as they say, with a huge apartment on 106th Street on Manhattan’s Upper West Side. By the time I recorded her, her voice was clearly not very powerful, but she still could sing an unaccompanied Yiddish folksong in a compelling way. The song Oy vey mame was one of two she remembered from her shtetl. Ruth Rubin recorded her singing both in 1962 and they are in included in the publication Yiddish Folksongs in the Ruth Rubin Collection (Mlotek/Slobin, 2007). Oy vey mame is on page 54; a scan of that page is reproduced below. As Rubin notes, the closest variant found to this song is in I. L. Cahan’s collection Yidishe folkslider mit melodyes (1957, #150). The dramatic last line that Ita sings about commiting suicide is not found in that version. This recording was made in the Bronx in the mid-1980s at the Gottesman’s house. Ita’s other shtetl song, Got hob bashafn mentshn af der velt is found in the Rubin collection on pages 61-62. She picked up many other songs on her travels which we hope to present in future postings. Pete Rushefsky adds: Each verse of Oy vey mame is comprised of two sections employing distinct modal characters. The modulation between the two sections creates a haunting sound that imbues the piece with gravity and tragedy. The first section is transcribed in B-major, but the melody initially implies the subdominant F# major. The second section shifts to a tonal center of C# in a mode described by the pioneering Jewish musicologist Abraham Zvi Idelsohn as the “Ahava Raba” scale, also known by cantors and klezmorim as “freygish” (an allusion to its similarity to the phrygian scale). Ahava Raba is additionally consistent with the Turco-Arabic maqam of hijaz/hicaz. Here, the melody descends from F# to the new C# tonal center, followed by a second descending passage from F# further down to the subtonic B. Finally the section resolves through an ascending/descending sequence with an ending that mirrors the initial F# to C# descent. 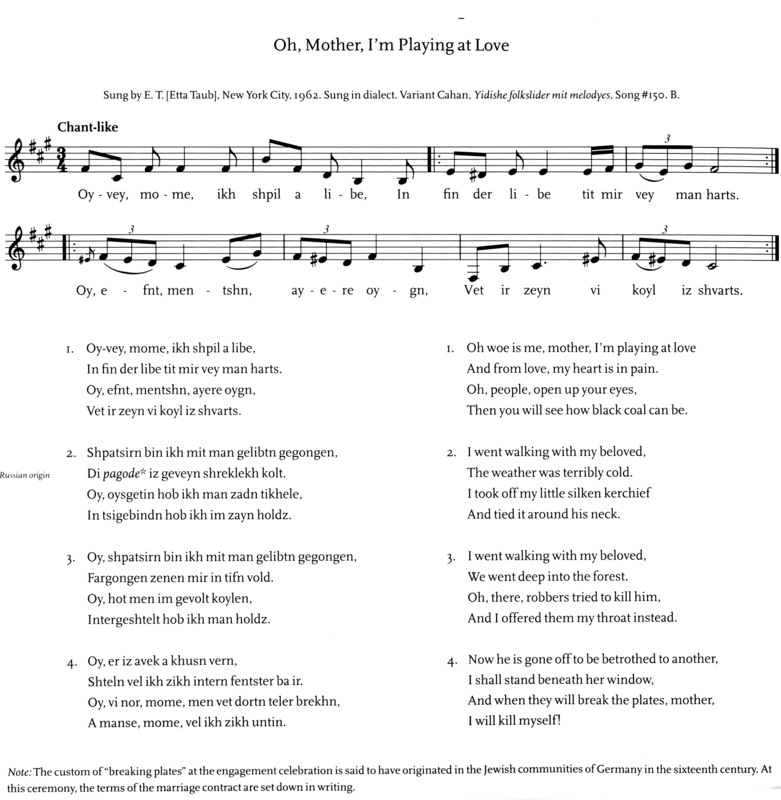 The written musical transcription below contains a few discrepancies from the recording – it is likely there are errors in the transcription, though I have not heard Rubin’s recording of Taub to analyze differences with the Gottesman recording made two decades later. This entry was posted on August 4, 2010 at 10:49 pm and is filed under Main Collection with tags Dniester, heartbreak, Ita Taub, Itzik Gottesman, Stidenitse, suicide, Ukraine. You can follow any responses to this entry through the RSS 2.0 feed. You can leave a response, or trackback from your own site. To my ears the distinction between the two is that the former more strongly implies a reciprocal relationship whereas the latter expression is also suitable in a case of unrequited love or a one way ”crush.” And yes, ”playing at love” is clearly off the mark.